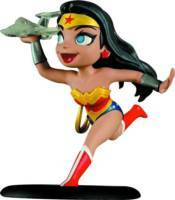 This Wonder Woman Q-Fig Figure springs into action with her trademark tiara, bulletproof bracelets and Golden Lasso of Truth, while holding a play-sized version her stealth invisible jet. Captured in a joyful pose, you can sense her exuberance. This charming chibi-style figure designed by Mohammad 'Hawk' Haque includes a whiteboard speech bubble and marker for writing your own phrases or sound effects. Stands 3 1/2' tall.